As Howard notes in his introduction, all social movements feel fear. This is often engendered by repression. However, there are ways to overcome them. This edition of Broken Rifle looks at various experiences of fear and repression, and how they can be addressed. Fear is something that every social movement has to deal with, whether in situations of severe repression or in relatively open societies. Discussing fear under the Pinochet dictatorship, the Chilean social commentator Manuel Antonio Garretón referred to two archetypal childhood fears: the fear of the dog that bites, and the fear of the darkened room. The specific threat that we can see, assess and work out how to handle, and the generalised threat of an unknown - a room where something bad might be waiting for you. In a dictatorship or under an occupation, the presence of fear is tangible - yet there are always episodes where somehow people overcome that fear and take action. In relatively open societies, the fears may not be so obvious - yet they are there, somehow always a factor in maintaining obedience and conformity, in inhibiting people from questioning authority or sometimes simply from being who we want to be. The East African nation of Eritrea is amongst the highest refugee-producing countries in the world. There are a number of reasons for this. People flee from 'national service', or as it could be called, 'a campaign of forced labour or slavery'. Or, they leave because of the lack of freedom of expression - the imprisonment of journalists, government Ministers and Generals in 2001 in particular made Eritreans lose their confidence in their ruling party. Reading a newspaper recently, I came across the words of some young girls who left home: 'If I want to survive I should not trust people'. These are the exact words I repeatedly heard while I was in prison. I didn't write after I got released. I wanted to, but it felt too hard. Although I sensed something simmering inside me, I was not able to figure out what it was. I felt helpless; I couldn't be bothered to do anything. I didn't want to meet people. Those were the times when I was obsessed with the thought of staying alone. I felt like I had forgotten how to have equal relationships. I was overwhelmed by the fear of how I would be accepted by others. I didn't do anything that might have caused loss to me either. I've asked myself if I am using the fact that I was in prison as an excuse to cover up who I really am. What if prison is not different from society at all, and I was just bewildered to be thrown out to the wild reality I had not recognised before? The past few years have seen a change in the UK climate movement. Though all signs point towards an exciting resurgence of direct action on climate, until a few months ago there was a distinct lull in radical grass- roots action on climate change, dating back to the failed COP15 climate talks in Copenhagen (December 2009), where the movement's biggest mobilisation ended in disappointment and despair. Most Israelis believe that an ongoing state of emergency is justified, and that a large conscript and reservist military will help to keep them safe from surrounding enemies, who desire to annihilate Israel and 'push us into the sea'. Given the sharp increase of repressive measures by the Belarusian government and its security services against the opposition it is currently almost impossible to be socio-politically active. However, for Nash Dom ('Our House' in Russian), a network for the protection of citizens’ rights – which since 2005 has cooperated with the German Bund für Soziale Verteidigung (Federation for Social Defence) – it has become easier to protect activists from state repression in the last couple of years. Usually when we think of repression and activism we focus on that enacted by the state through bodies such as the police. This article explores repression within activist groups. By this I mean the inhibition of the views and contributions of certain members of a group by other group members. Earlier this year I lived for three months in Bethlehem, in the Occupied Palestinian Territories. I served as part of the Ecumenical Accompanier Programme in Palestine and Israel (EAPPI). Ecumenical Accompaniers (EAs) are human rights observers that seek to monitor and report violations of human rights and international humanitarian law; offer a 'protective presence' (more on this later! ); stand in solidarity with vulnerable communities; and do advocacy work. To know that one is not alone is a basic psychological tool for dealing with fear. It becomes crucial if those you are with are able to reduce the risk that you face. Though there is often also a certain strength in numbers – 1,000 protesters are less likely to be arrested than 50, because arresting 1,000 may test the capacity of those doing the arrests and lead to more public attention – a capacity for protection normally requires something more than just bigger numbers. On 25 September 2012 and the following days, tens of thousands of people surrounded the Congress of the Spanish Government in Madrid, with the MPs inside, in an action called '25S Rodea el Congreso' (Surround the Congress). The objective of 25S was to request the resignation of the government as a first step in the putting in motion of a process to create a real democratic society. In the late 1990s, Afro - Colombians living in Bajo Atrato were displaced by military and paramilitary groups, who had the dual objective of establishing military control and exploi- ting the land. The displaced population initially lived in refuges, but with the support of local and interna- tional organisations, they began a campaign to return to their lands. Regrouping, they established CAVIDA - the 'Communities of Self-Determination, Life and Dignity' - and lived in two settlements together. After 11 years in the WRI office - and a period before that in which he was WRI treasurer and principal organiser of the 2001 study conference on Nonviolence and Social Empowerment - Andreas Speck is leaving the WRI office. From 1 January onwards, he will be cycling from Buenos Aires northwards. One of the best compliments for an anarchist - or indeed any nonviolent activist - is to describe them as a practical visionary, and Andreas has been the epitome of a practical visionary. 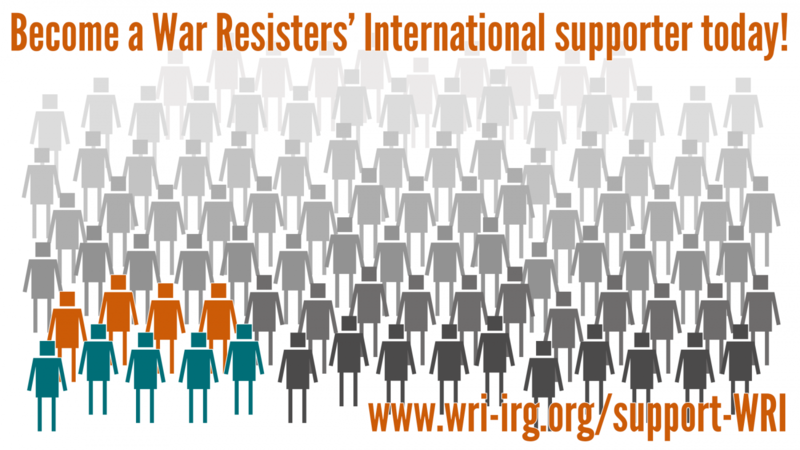 As the main architect of WRI's Right to Refuse to Kill programme, he has worked for the rights of objectors yet keeping firmly in mind that the point of war resistance is to prevent war and build a better future. Through this programme, WRI has effectively interceded with international institutions while keeping our character as a mutual support network trying to change the world, rather than becoming yet another "NGO". All over the world - from Turkey and Egypt to Russia, South Korea and Latin America - there are objector groups who have benefited from his understanding of their context and support in making them more effective. The 2013 Housmans Peace Diary is the 60th edition. It includes quotations, daily anniversaries (for celebration or protest), and a 1600-strong directory of peace and related organisations worldwide. The theme of this year's feature articles is "Taking risks to resist" - looking at the bravery of nonviolent activism for peace and justice. After 13 years in power, there are many unresolved problems in Venezuela, despite the promises of President Chávez's government. One problem is the impunity of the police and military, and their violation of the right to life. In the poor neighbourhoods of Barquisimeto, Venezuela's fifth largest city, families whose relatives have been assassinated or abused by the police or military cannot not hire lawyers to represent them. In 2004 they formed a popular committee to organise themselves, called the 'Committee of Victims Against Impunity' (Covicil in Spanish).